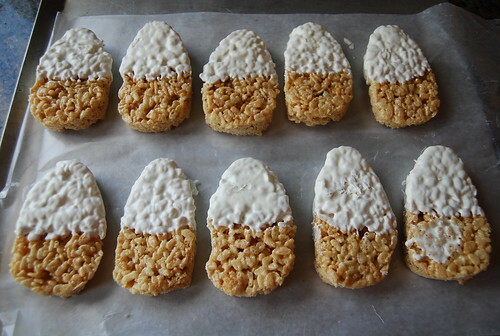 These candey corn rice krispie treats are as fun to make as they are to eat. If you’ve been reading my blog for long you know that I LOVE candy corn. I go through bags of it each Halloween season. I think it is just about the cutest candy there is – can candy be cute? So not only do I love candy corn but I love anything candy corn shaped. While I was thinking of treats to fill the College Kid Care Package I knew that Rice Krispie treats are always a big hit with my kids. 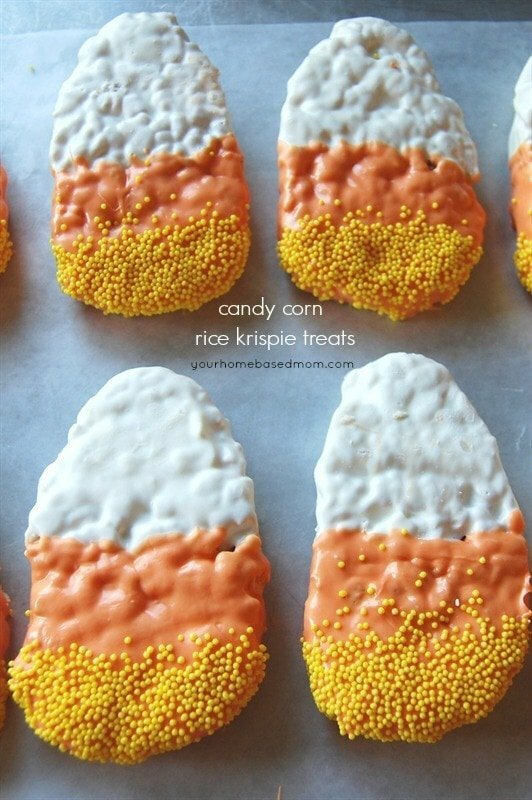 So why not candy corn shaped Rice Krispie treats! 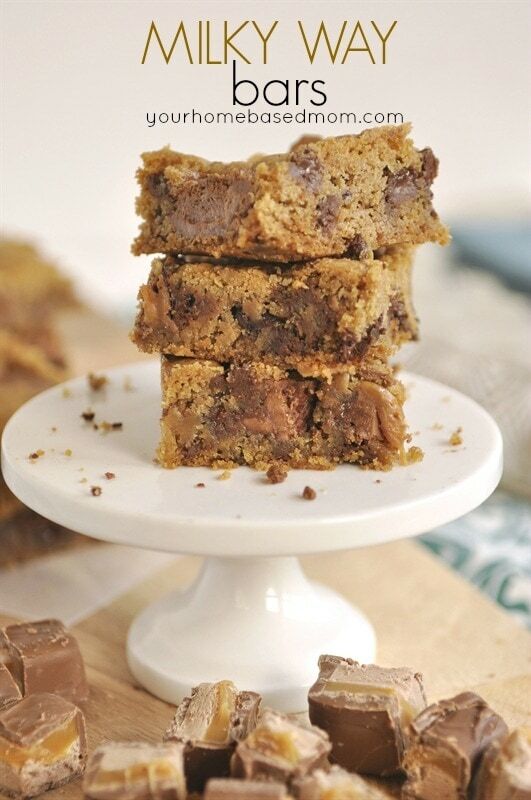 I used the recipe right off the back of the cereal box but if you want an extra yummy Rice Krispie treat try this recipe! After spreading the Rice Krispies into a 9 x 13 I used my candy corn shaped cookie cutter – yes, I have a candy corn shaped cookie cutter, doesn’t everyone?! If you don’t have one you could just cut the shape out of paper and use it as a template. 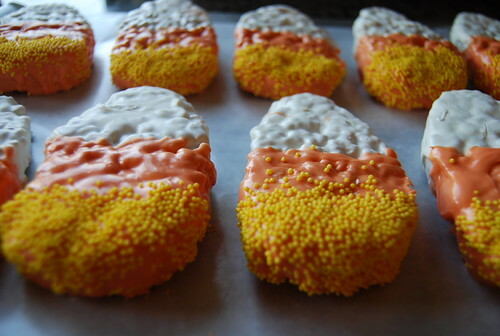 Using Wilton’s candy melts I dipped half of the candy corn shaped Rice Krispie treat into the white melted melts – that sounds strange but not sure what else to call it! After dipping I placed them on a wax paper lined cookie sheet for them to harden up. 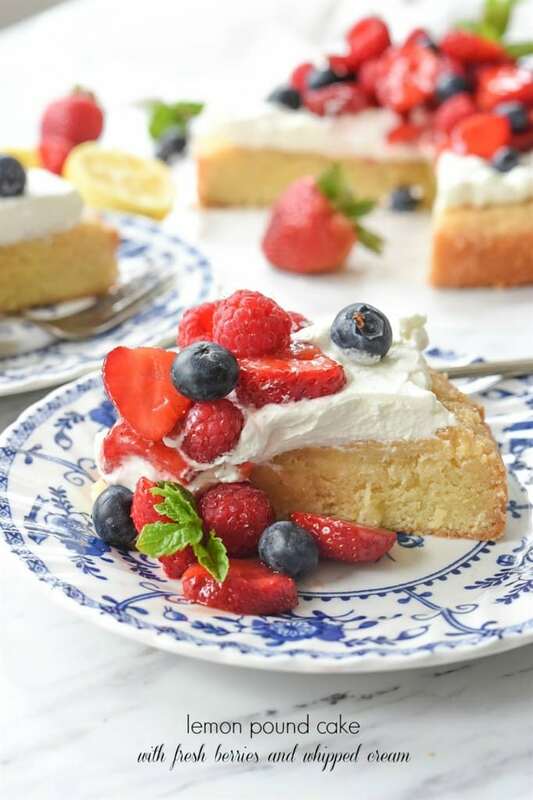 Once they were hard I dipped the other half into orange melted melts and while they were still wet I sprinkled yellow sprinkles on the bottom and viola! Candy Corn!! 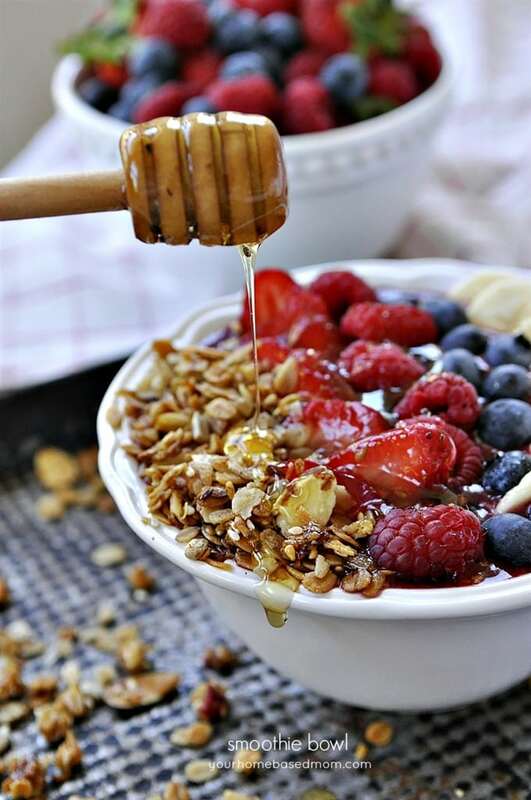 If they are slow to harden you can refrigerate them to speed up the process. Since the Rice Krispie candy corn turned out so cute I looked for something else in my cupboard to turn into candy corn and I found a bag of pretzel rods. 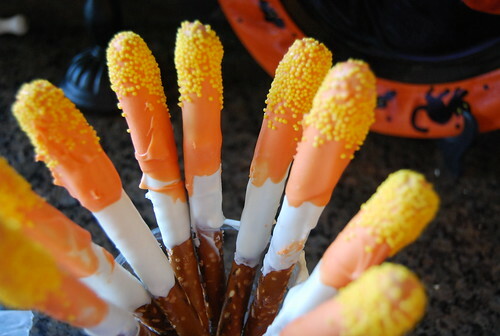 With the leftover melts I made candy corn pretzel rods! Aren’t they cute! 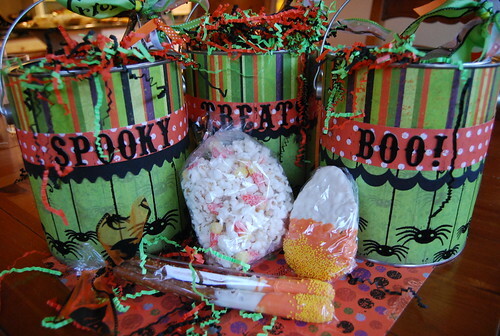 So my Halloween decorated paint cans were filled with candy corn shaped Rice Krispie treats, candy corn pretzel rods, white chocolate and candy corn popcorn and other trick or treat candy. So do you think those college kids will enjoy their care package!! these are too cute!!!! can i be your college kid too???? 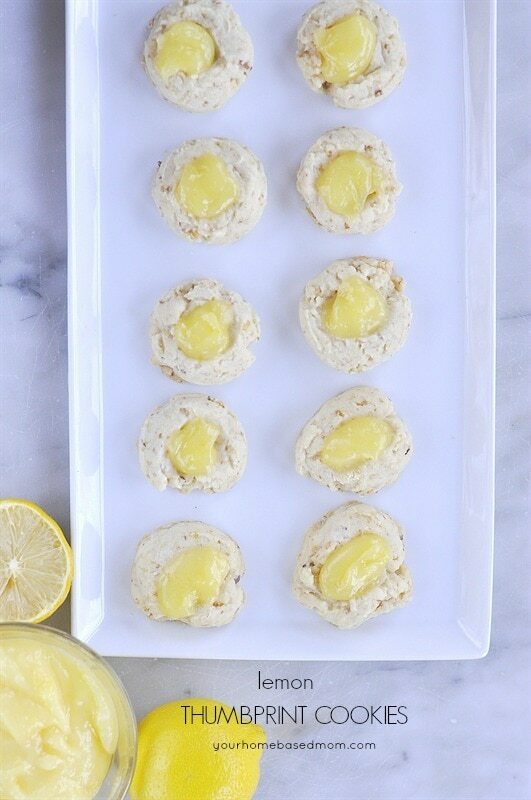 Right after reading your blog, I ran across this link & thought immediately of you! What a great idea! And yes, I think you have shown that candy corn can indeed be cute. What lucky kids you have! You are so creative. And always amaze me with what you come up with. Thank you for sharing. Oh! So so cute! My daughter loves all things candy corn as well. I’ll have to make some of these for her. You’re so clever! I wish I could adopt you as my 2nd Mom and I was getting one of those care packages! Sooooo cute! Ok, those are possibly the cutest Halloween treats I’ve yet to see EVER. I love them! WOW! I love to make rice crispie treats with the grand children and we love candy corn. 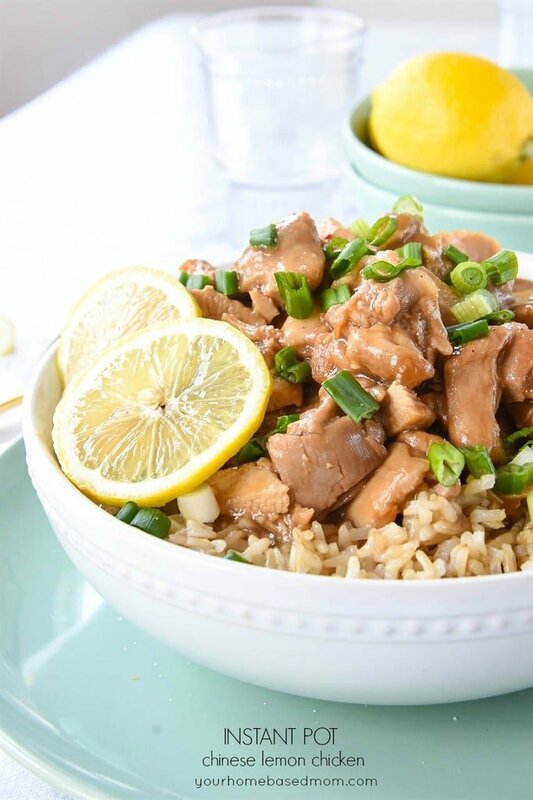 . . .What an amazing combination. Your cans are darling and I love the pretzel idea too. THANKS FOR SHARING! Hey Leigh Anne, I was searching through my cookie cutters for a candy corn shaped cutter tonight. I settled for a pumpkin instead. You’ll have to tell me where you found it. Adorable! Dawn, Wish I could remember where I got it. I use to have quite an addiction to cookie cutters and have a HUGE collection of them! You are welcome to borrow it! Ladies – I can’t take full credit for the idea. I actually saw a rice krispie treat similar at the checkout counter at HomeGoods and thought “I can do that” I am a great copier! I love the CASE method – copy and share everything!! I love candycorn too, and this is very cute! I have to take treats to a Halloween party on Friday night ~ I think I just found what I’ll take! Thanks for the ideas! These are so cute! Your blog is so fun, I really like the festive posts :). I took an old easter egg cookie cutter and reshaped it into a candy corn shape. Works beautifully. You can always get another easter egg cookie cutter at easter. I stumbled upon your blog. I agree with Sarah on your creativity. 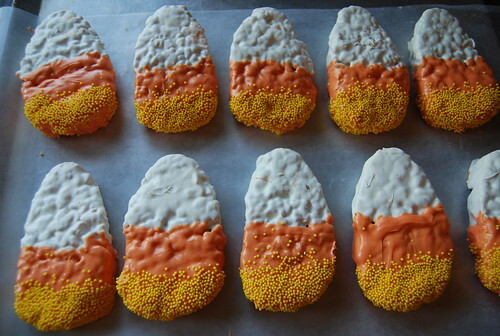 My cousin, who is into cake baking, would be inspired with your candy corn creations. I’m emailing her your site. adorable!!!! how lucky your kids are! might have to make some of those for all the nieces and nephews for halloween! how can you go wrong with rice krispie treats, pretzels and chocolate! p.s. 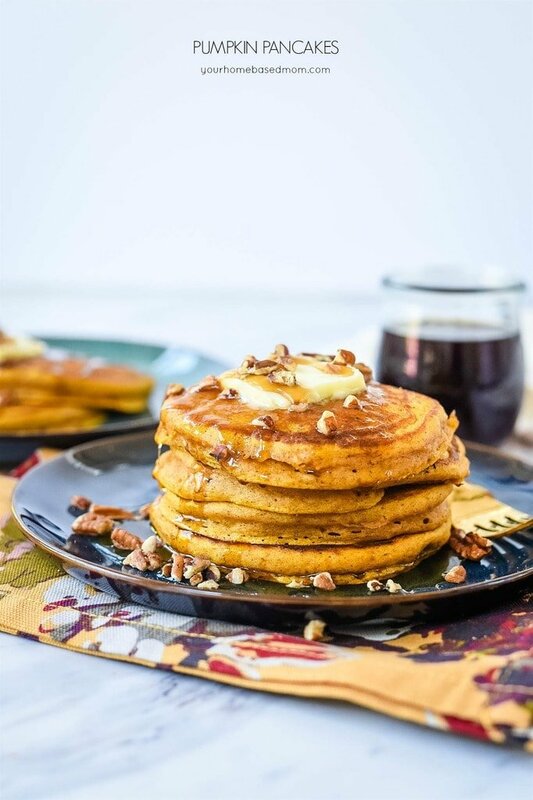 this would make a great halloween/thanksgiving giveaway!